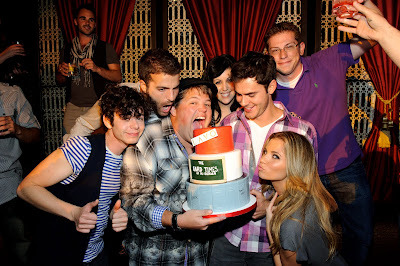 Friday night the cast of the new MTV show The Hard Times of RJ Berger gathered at LAVO with the show’s writer/director David Katzenberg and writer Seth Grahame-Smith to celebrate their premiere. Paul Iocono, who plays RJ Berger, along with Jareb Dauplaise, Kara Taitz, Amber Lancaster and Jayson Blair hammed it up on the red carpet before heading into LAVO’s private dining room for dinner. Once upstairs at a VIP table, the young Hollywood group could not contain their excitement, dancing and drinking Ketel One cocktails. The ultimate surprise of the night was a huge shout out in the club and a cake in their honor. Shane West celebrated his 32nd birthday with a dinner of Italian favorites before heading up to the nightclub where the party continued with cake and cocktails. 90210 star Ryan Eggold was spotted partying with friends at a nearby table in the nightclub. Alexis Bellino from Bravo’s The Housewives of Orange County continued the party for her husband Jim’s 48th birthday. The couple and a group of friends dined at LAVO, enjoying Pomegranate Lemonada specialty cocktails along with Lobster and the signature Kobe meatball before heading up to the club.